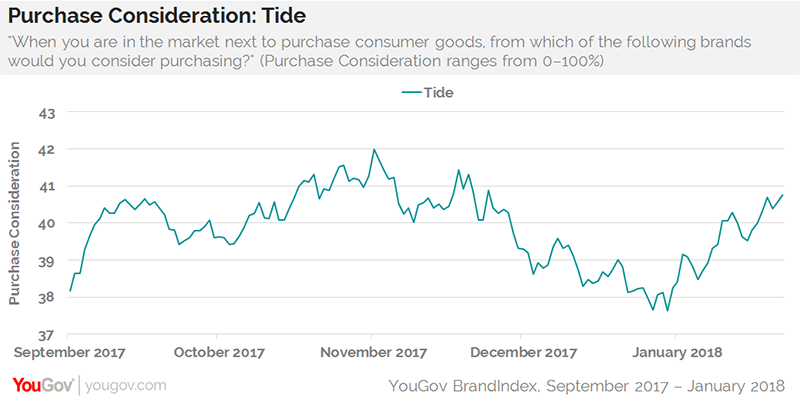 The “Tide Pod Challenge” may be sinking Tide’s consumer perception level, but that doesn’t seem to be stopping people from buying the detergent, according to YouGov BrandIndex. All the signs point to a possible sales crisis: Tide dropped to its lowest consumer perception level in nine months after the first viral videos – which encourage people to bite into the dishwasher capsules – began catching on at the end of last November. 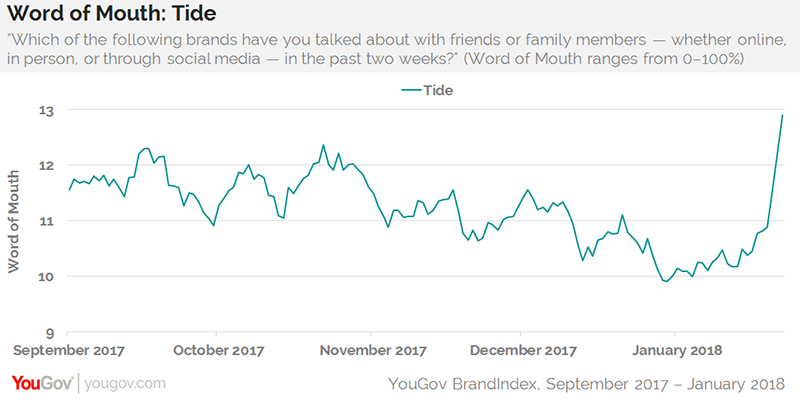 And Tide’s word of mouth is the highest it’s been in more than three years: 13% of adults 18 and over have talked about the detergent with family and friends over the past two weeks. However, consumer purchase consideration of Tide has been going straight up since the beginning of 2018. On December 31, 38% of consumers would consider buying Tide the next time they were shopping for household or personal care items. That number grew three percentage points to its current 41% – an unexpected turn considering the harsh publicity that has surrounded the controversy. What could the possible explanation be for this? Perhaps a “reverse psychology” moment where consumers who have never bought or heard of the product before may now consider buying it. Along with its Word Of Mouth and Purchase Consideration scores, YouGov BrandIndex measured Tide’s consumer perception using its Buzz score, which asks respondents "If you've heard anything about the brand in the last two weeks, through advertising, news or word of mouth, was it positive or negative?"